NCR books are used to manage your business finances in an effective manner. They help you see what is coming in and what is flowing out of your business. Here at Perth Printing, WA, we have a wide range of choices when it comes to delivery books, receipt books, docket books and invoices. We provide these in the format of a pad or loose leaf set. Another detail is that we provide very affordable prices and can have your NCR books products personalized with logos and contact details. With these books, therefore, both you and your customers could track transactions. Furthermore, these could books allow you to record your company dealings in a systematic way, do quick referencing and enjoy free bookkeeping. 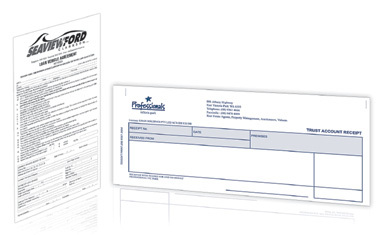 Available in duplicate or triplicate forms, our NCR books can have one or two colours. You could get them from the company’s store in south Perth.